Isn’t this Etsy Treasury super fun? It was curated by Lisa Ross of Divine Bijoux, a shop full of colorful jewelry. My vintage Colonial Glass flower tray was featured with all these other cute treasures. Come check it out, leave a comment or click through and buy something for yourself! 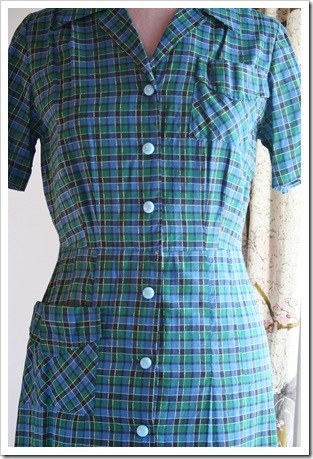 As part of “Project Declutter” I have finally started posting some of my vintage clothing items. Several of these pieces have been revamped with slight alterations to make them a little more hip, while others have been left au naturale. 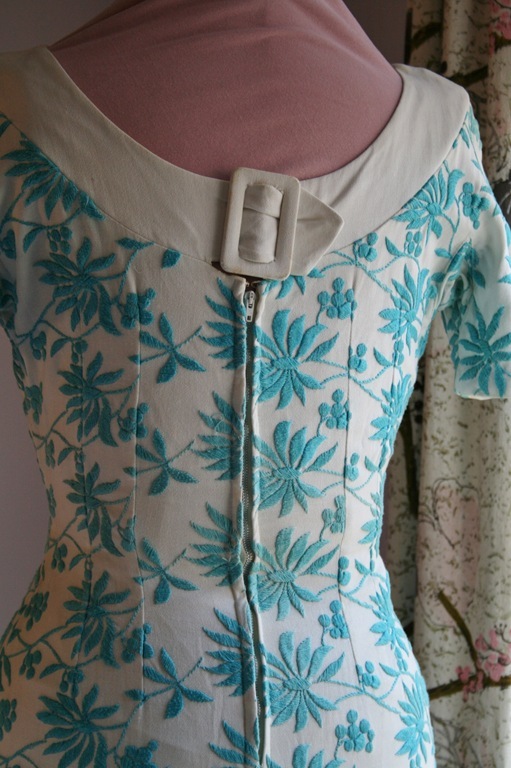 An untouched vintage dress with blue brocade flowers. Click here if you are interested in more details. 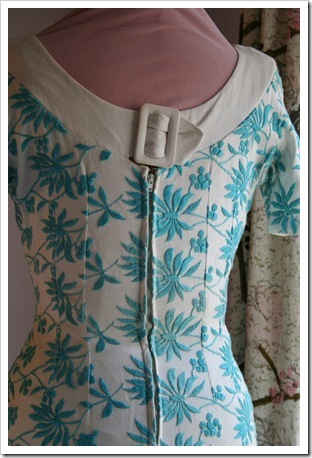 Vintage dress in pale blue linen with lace collar. 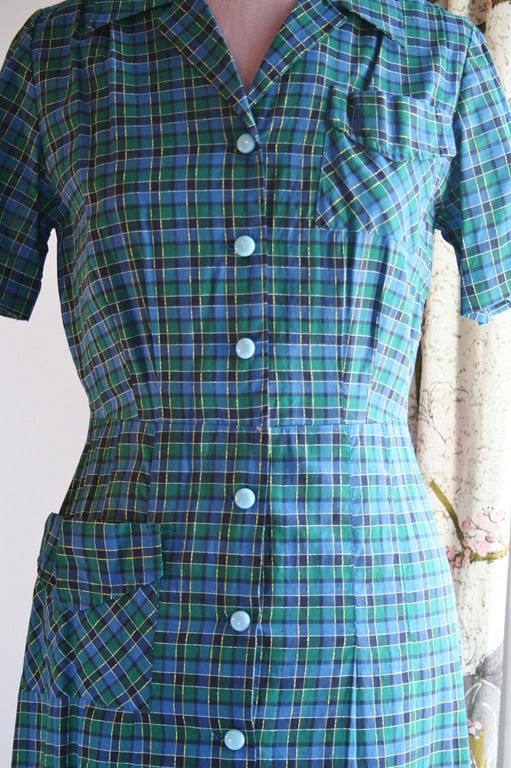 Vintage dress in classic schoolgirl plaid. Stop by my Etsy Shop to see more vintage additions! I scored an Etsy Treasury this morning and added some very talented crafters and artists from the Nashville, TN area. I like to shop local, and sometimes I even look for great stuff in other specific cities. I hope everyone is almost finished with their holiday shopping at this point, but if you are not then please check out the wonderful world of handmade in the shops of Etsy. Below is the treasury I created, with the alternates in view. Click Here to view and shop this Treasury. Craft Fair Hell Has Ended...FINALLY! As promised, I am including photos of my bigger booth set up. These also include items that will be posted to my Etsy shop over the course of this next week. From way back...vintage quilts and tablecloths are the base. Front right side of booth....keepsake and jewelry boxes. Front left side back to left corner....vintage fabric pocketed aprons and more handbags. Here is my mom fixing up her display of handmade ornaments on our kitschy silver tree. She created the most hysterical things from polymer clay and recycled light bulbs. Her imagination always amazes me and when all was said and done we did a great trade for Christmas gifts this year. I know some lucky people that will be getting some pretty cool ornaments for their trees! Arranging the ornaments.... and my Holiday Albums underneath. I also stumbled upon several other Etsy crafters while I was there. Kim Smith, owner of White Cottage Design uses quite possibly the coolest color combos evah! I really wanted to indulge myself and purchase one of her owl shadow boxes, but I never got a chance to go back over to her booth. She shared her set up with Jodi Reeves of The Creative Jar, also known as "Jodi The Crafty Chick". She makes really neat paintings and being textile obsessed, I also admired her fused plastic bags with bits of fabric- super hip! I had a very fun conversation with the owners of Ragan's Fabric and Goodies and Just For Us Girls. Cheryl and her husband were a hoot and she makes the sweetest clothes from Amy Butler fabrics. Check out these shops when you get a chance and help support some really great people/crafters/artists while you are at it! At least that is how I am feeling this week. One down and one to go. I really do enjoy attending these events, especially when I meet great people and see other cool crafts. I met several other Etsy sellers at the small church craft fair I attended last Friday and I hope to meet more at the event this Saturday. These two were a hoot!- Lori Long and Megan Wilkes, owners of Happy Monkey Art. They create clay sculptures of hysterical little scenes. You just have to check out their shop to see what I mean. Megan also paints and has another shop for her art called, Thru Aries Eyes. Sarah Paddon, a jewelry artist, was there too, showing off really nice pendants necklaces. Check out her Etsy shop Cottage Island Creations. Here is my mini-booth set up for the church fair last week. It was a family festival, so I just concentrated on my baby and kids items and advertised for the other fair I am attending this weekend. I will have my full booth at the Saturday event with lots of holiday products, and I will add those pictures later. Stroller Blankets in Vintage Fabrics, Tooth Fairy Pillows from a Vintage Quilt, Changing Pads, Play Mats and Baby Quilts in Reproduction Vintage Fabrics, and Onesies, T-Shirt & Bloomer Sets, and Cap and Onesie Sets with Vintage Baby Images.